A Sweet Cake » Blog Archive » Almost Halloween! I like to do themed cakes for my husband’s monthly work cake when I can. This month, of course, it means Halloween! In the past I’ve done a pumpkin, ghost, or bucket of candy. This month I went with an idea I saw from somewhere online for a casket ~ complete with creepy skull! 🙂 This cake was carved out of an 11×15 sheet cake (double layer). 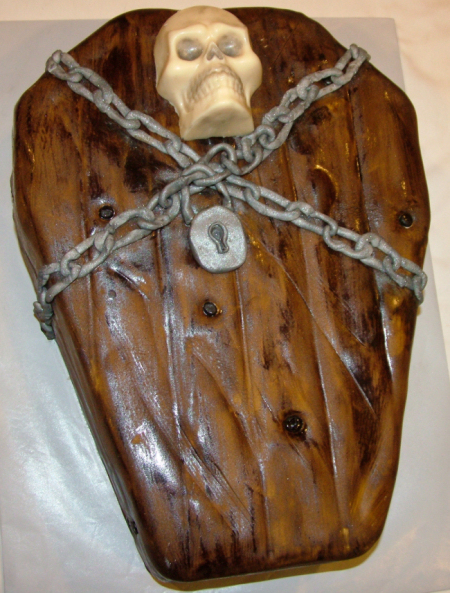 It is covered in fondant and painted and marked to look like wood. 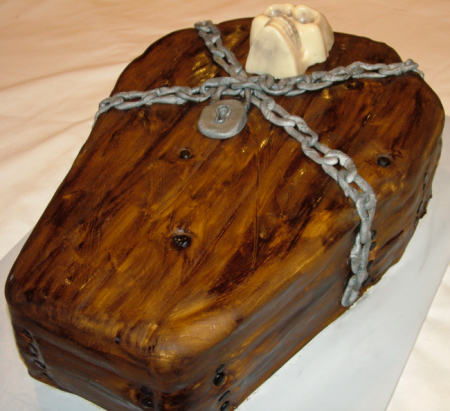 The chain is also fondant. The skull is made from white chocolate candy melts using Wilton’s skull candy mold.